A professional photographer gives tips on how to photograph breaching whales. Learn how to prepare so you get great shots when you take a whale-watching tour. I used to get lots of questions about how to photograph breaching whales when I taught photography in Massachusetts, home to Stellwagen Bank. Stellwagen Bank is an undersea shelf or bank that disturbs the flow of the ocean and the currents there stir up krill in the water, making it something like an all-you-can-eat buffet for hungry whales at certain seasons. Whales breaching are easy to see in that area, since it is a popular place for them. If you haven’t seen a whale breach up close, it is a fantastic sight to behold, and if close enough, a somewhat frightening event due to their sheer size. It is easy to imagine a whale capsizing a small ship, although it is very unlikely. There are really two factors you need to pay attention to when thinking about how to photograph breaching whales. First, go where the whales are. Second, set up your camera appropriately to take these photos. The first step in how to photograph breaching whales is to be where the whales are. This is a little obvious. You can’t photograph whales in your back yard. 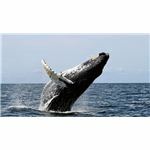 There are many great places to see whales off the coast of the United States and Canada, as well as in other countries. While you can probably rent a boat to go see whales on your own and spend more time photographing them, I would recommend taking a tour. You can book a whale watching tour in lots of places if you plan ahead and go at the right season. The tours will take you to where the whales are most likely to be and are run by professionals who know the water currents and can tell you in advance how likely it is that the whales are in the area. The best part is that a lot of tours have a guarantee that you will see whales on your trip or else you can come back the next day for no charge. When thinking about how to photograph breaching whales, the key is in preparation. Whales are giant animals and move slowly, but since most of a whale’s body is under water, the slight amount of the animal may be all you see. Thus, you should act fast. Get prepared by setting your camera at the outset. Do some test shots as you are traveling to where the whales are to be sure that your exposure is set well. I recommend a high shutter speed, telephoto lens (75-300mm or more is fine), and an f-stop of 8 or higher. Unless you are well-versed with the intricacies of custom white balance, set it to cloudy. Otherwise, set your white balance to a custom reading. When shooting, count on taking as many shots as possible. Set your camera to rapid-fire and keep it near your face. When you see a whale about to breach the top of the water, start shooting. You never know whether you are going to get a majestic scene or just a little bit of fin or back, so just keep firing until the whale goes back under water.